Skopelos (Greek: Σκόπελος) is a Greek island in the western Aegean Sea. Skopelos is one of several islands which comprise the Northern Sporades island group, which lies east of the Pelion peninsula on the mainland and north of the island of Euboea. It is part of the Thessaly region. Skopelos is also the name of the main port and the municipal centre of the island. The other communities of the island are Glossa and Neo Klima (Elios). The geography of Skopelos includes two mountains over 500 m; Delphi (681 m) in the centre of the island, and Palouki (546 m) in the southeast. With an area of 96 square kilometres, Skopelos is slightly larger than Mykonos (85 km2) and Santorini (73 km2). The nearest inhabited islands are Skiathos to the west and Alonissos to the east. 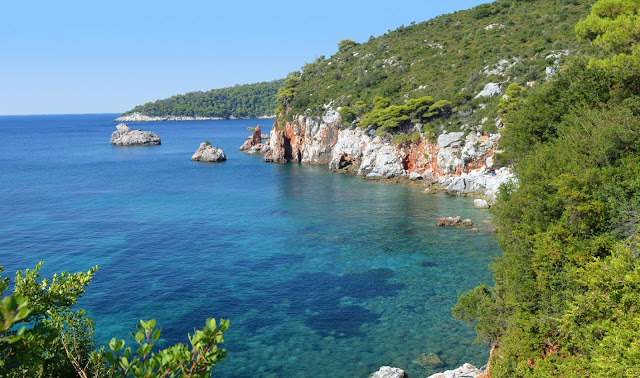 According to legend, Skopelos was founded by Staphylos (Greek for grape), one of the sons of the god Dionysos and the princess Ariadne of Crete. Historically, in the Late Bronze Age the island, then known as Peparethos or Peparethus (Ancient Greek: Πεπάρηθος), was colonised by Cretans, who introduced viticulture to the island. Perhaps because of the legend of its founding by the son of the god of wine, the island was known throughout the ancient Greek cities of the Mediterranean Sea for its wine. The play "Philoctetes" (first performed at the Festival of Dionysus in 409 BC) by Sophocles includes a wine merchant lost on his way to "Peparethos, rich in grapes and wine". The economy of Skopelos is now fully dependent on the tourism industry which supports construction and other development-related industries. Though tourism is greatest during the summer months, Skopelos is also a year round retirement destination for Northern Europeans. The popularity of the island with tourists increased due to the filming of "Mamma Mia!" on the island in September 2007. What gorgeous water - it looks so inviting. Wow what a fabulous view. Gorgeous Gorgeous Gorgeous! Have a lovely week!